KATHMANDU, Dec 15: Bijay Tamang of Kamalamai municipality in Sindhuli district put on a reluctant smile and pointed to his right leg's wounds caused by poorly injecting controlled drugs. “It was alcohol at first. Then I tried pharmaceutical drugs in the last eight years but I got hooked to painkillers in the recent years,” said the 30-year-old Tamang. Since the last one and half years, Tamang has been injecting those controlled drugs more frequently. “I tried to heal but my addiction to powerful painkillers continue to remain as I was driven by lots of family problems,” he said, adding that his parents were divorced, wife couldn't accommodate with him and he couldn't continue his job as a microbus driver. Last week in Chabahil, he exchanged six ampoules of pharmaceutical drugs with his only belonging-mobile phone, with a drug dealer who had arrived at Kathmandu from Siraha. Tamang was arrested while injecting controlled pharmaceutical drugs in pubic place. Thirty-two-year-old Anup Baraili, originally from Topgachhi VDC in Jhapa district, has a similar story to share for his addiction and involvement in peddling the contrabands to major cities of Nepal from Indian border towns. “After all alternatives to fulfill my appetite were closed, I was drawn to the underground drug trade,” he said taking a deep breath. He was a former brown sugar addict but since the last seven years he jumped into pharmaceutical drugs abuse. Baraili pointed out that the growth in number of pharmaceutical drugs abusers was because of the easy accessibility of such drugs and cheaper price as compared to hard drugs like heroin and cocaine. Another advantage is low legal penalties if caught. The Narcotic Control Bureau (NCB) of Nepal Police said unless effective monitoring and distribution of pharmaceutical products, companies and drug stores are carried out, the problem would aggravate in the coming days. A survey report of the Central Bureau of Statistic (CBS) in 2013 said Nepal had 91,534 active hard drug abusers. The number had increased by 98% as compared to 2012. The number of controlled drug abusers in the period was about 50,000. But analyzing the recent trends of arrests and seizures in the last few years, experts assume that the number of pharmaceutical drug abusers is soaring. 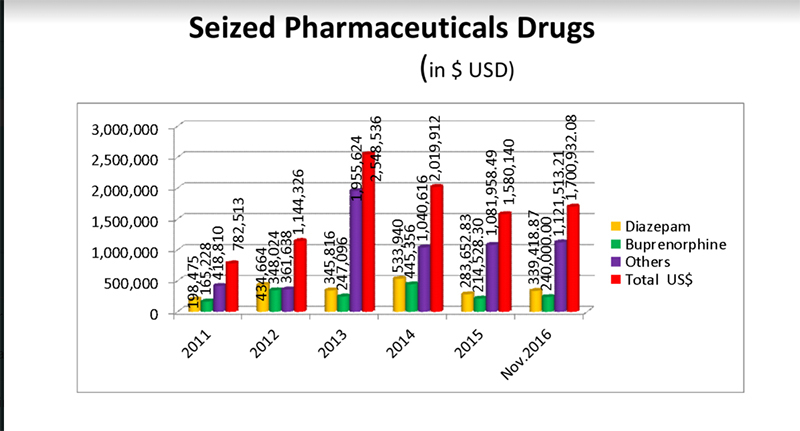 In the past six years only, the police have seized pharmaceutical drugs worth USD 9.7 m in illegal market. 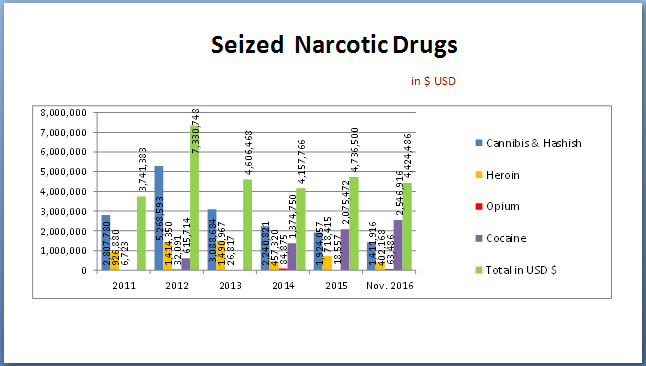 According to NCB officials, the prime reasons behind the growth of controlled pharmaceutical drugs were lack of control mechanism in the open border and easily accessible pain killers at drugs stores. “Hard drugs like heroin, cocaine, opium are not easily available and comparatively cost high in the illegal market as compared to those controlled drugs like diazepam, buprenorphine , phenargon among others,” said NCB Director DIG Jaya Bahadur Chand. Nepali youths have been using too many opiate pain killers, sometime leading to deaths through overdoses, he added. 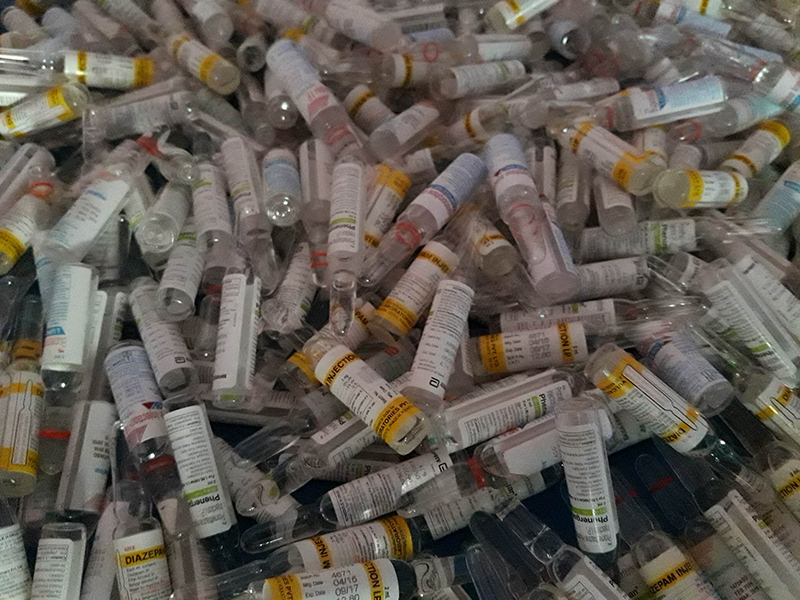 In a recent NCB bust, five people were arrested in possession of 1,060 ampoules of diazapam, 1,060 ampoules of Nurphin and 1,060 ampoules of phenargon. Each ampoule of the controlled drugs costs around Rs 1500. The cost was Rs 500 in 2011 and Rs 600 in 2012. “Weak legal penalties have also contributed to the growth of pharmaceutical drugs abuses in Nepal,” DSP Apil Bohara of NCB said. According to Narcotic Drugs (Control) Act, 1976, offenders of hard drugs smuggling and abuse, shall have to face 15 to 20 years of imprisonment but in case of controlled drugs it is just 2 to 10 years only. The major entry of the controlled narcotic drugs take place from India through Biratnagar, Birgunj, Bhairahawa among other bordering checkpoints. “Mandatory requirement of prescription for pain reducing medication for teens and youths below 25, providing adequate training to medical professionals, creating awareness to vulnerable groups and increasing legal penalties would help combat the growing abuse of drugs,” NCB officials said. They are also worried that increase in cases of injecting drugs and sharing of needles among peers have been contributing in transmitting serious diseases like Hepatitis B among others.